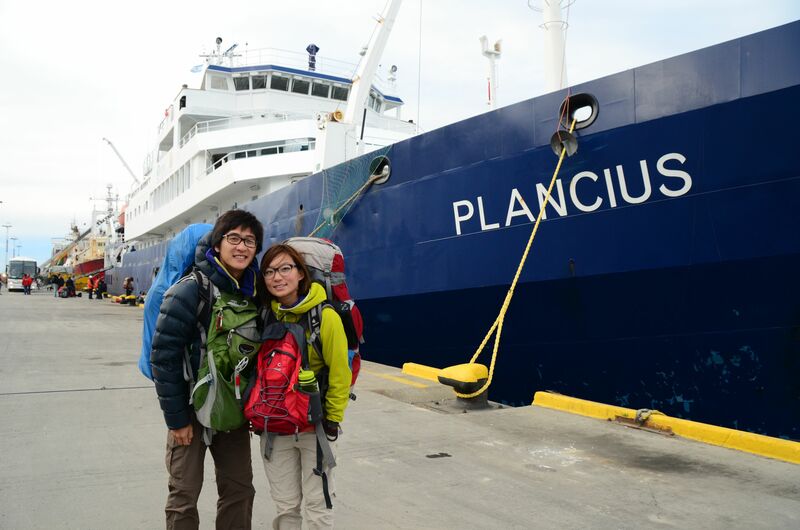 Waking up, we packed our bags, left them outside and headed down into the dining room for our last meal upon Plancius. Early in the morning we were already docked into Ushuaia, and the sights of land was comforting after two days of sea-sickness, but it was also a bittersweet feeling. At the pier, several other cruise ships were there, along with another ship of Oceanwide Expeditions, the Ortelius. Amongst our new group of friends, the couple from USA were actually booked into the Ortelius for today, taking an 18-day journey through to the South Georgian Islands and up to Montevideo, Uruguay. And when they booked, the ship was at 55% capacity! All of us missed the penguins already, and we were all tempted to see if we can catch a last minute deal to hop aboard. Unfortunately, no last minute deals existed, and the itinerary wasn’t very tempting with about 8+ days at sea…. Which in hindsight, was good because we did some pretty awesome stuff in the next 18-days, too. We met up with the group for lunch, and with about 15 people we headed to a rather popular cafe spot on the main Ushuaia strip. When our waiter asked us (individually!) where we are from, it was pretty funny to actually hear everyone say where they’re from in a different accent of English, with different ethnic backgrounds in different locales all over the world! And on the streets, we even saw some of the crew aboard the ship! The rest of the day was spent lazing around and catching up with the internet. 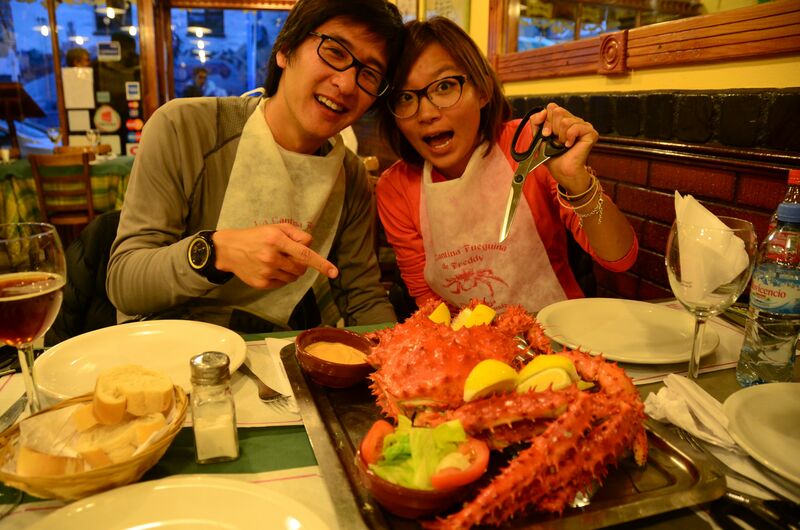 For dinner, we had some fresh king-crab. We hand-picked a big guy weighing in at about 2kg, and it fed a group of 4!!! Delicious. One day of rest, tomorrow we’re back on a 5am bus out of here! Good bye Ushuaia! We spent the morning garnishing supplies, alfajores and much needed Pringles to serve as snacks for the trip. Labeling itself as an ‘expedition’, we weren’t quite sure of the food on board and just to be safe, we brought a bit ourselves. And our travel agent also hooked us up with some clothing rentals, which proved invaluable later on as we were glad we didn’t have to dirty up our own clothes full of penguin poop. Walking to the pier with too much luggage, we read a few disclaimers about territorial disputes, had a few chuckles and were on our way. Due to the extreme lack of exercise, walking to the end of the pier was an arduous journey but we were greeted with the warm welcome of people wearing brightly coloured “STAFF” jackets. Our names were checked off the list, our luggage was brought onto the boat for us and we were officially greeted aboard the Plancius! You know that excitement you get when you were a kid and your family just bought a brand new house, and since you were a kid everything new is always exciting. That was the feeling we got when we boarded our boat, and were taken to our cabin! Uncertainty and past experiences with cruises during our trip have given us an impression of cramped quarters, unsatisfying meals and sea-sickness. Let’s just say, from our first impressions we were already quite happy with Oceanwide Expeditions and their well run ship. It also might be because of our backpacking expectations (read: low) that this trip really blew everything out of the water. The ship was small as it only takes 113 passengers, but it was recently renovated and feels really new. The common areas were comfy with more TVs than imaginable, there was tea anytime you’d like, and the coffee machine grinds out a delicious cup of anything at the press of a button! Oh, and there’s also a dedicated Leica Akademie guy here taking pictures and teaching classes! We also borrowed a set of Leica binoculars, which was used sparingly as binoculars on a boat = instant sea-sick. The first day, we sailed out of the Beagle Channel, met all the EXTREMELY experienced+knowledgeable staff, had a lovely dinner and were off in our cabins happily snoozing away. Sheltered in the Beagle Channel, we’ll be having some rougher seas as we cross the infamous Drake Passage for the next two days! long walk builds up the anticipation! dining hall, notice the windows look right at the waters…. After spending a day on the bus traveling to Ushuaia, we got some much needed rest and even cooked ourselves a meal at the hostel! It’s nice to eat something ‘at home’ instead of eating out, and you get to save a few bucks too! Everything is set for our upcoming cruise, so we had a spare day to visit the Tierra del Fuego national park. It was either this, or go gambling at the casino…. easy choice! The national park is rather large, and had numerous hiking trails in addition to camp sites for use. We chose to do the ‘coastal’ hike, where we were hiking along the shore line of some salt water channel, and along with the vegetation it definitely reminded us a bit of home. One of the coolest part though, was at the start of the hike, there’s this tiny little house situated above a small wooden dock extending into the water, and the sign says: “Correo”, or Post Office in Spanish! Inside is a small hut barely large enough for 2 people, but this is one of the most charming little post offices we’ve seen! It sells amazingly beautiful special edition stamps about the region, and some really pretty postcards. The best part, is that the post office is run by the most charming postal worker you can imagine, complete with a mustache that twirls upwards! He’s got a hundred different stamps that he fills your postcards with once you’re done writing them, and he’s even got postcards/stamps that are designed for him!!! He’s a living postal relic! It was all great fun, and we’ve never spent so much money on postage but it was well worth’d. Oh, the hike within the Tierra del Fuego national park was great. Tranquil waters with a backdrop of mountains, that’s always hard to beat. Again, pictures don’t do this place justice and neither are our words, but we’ll try. Dinner was some delicious home made pasta along with a bottle of wine. We also did our shopping to prep us for our big trip, just in case we get hungry aboard the m/v Plancius…. on our way to ANTARCTICA!!! Yeah!!! coolest post office ever. Look at that view! Alan got to the airport at 3:45am to take the 4:45am flight down to Ushuaia, but again due to weather conditions the flight was delayed for about 2hrs, leaving him with a really long nap in the Buenos Aires Jorge Newberry airport lounge. 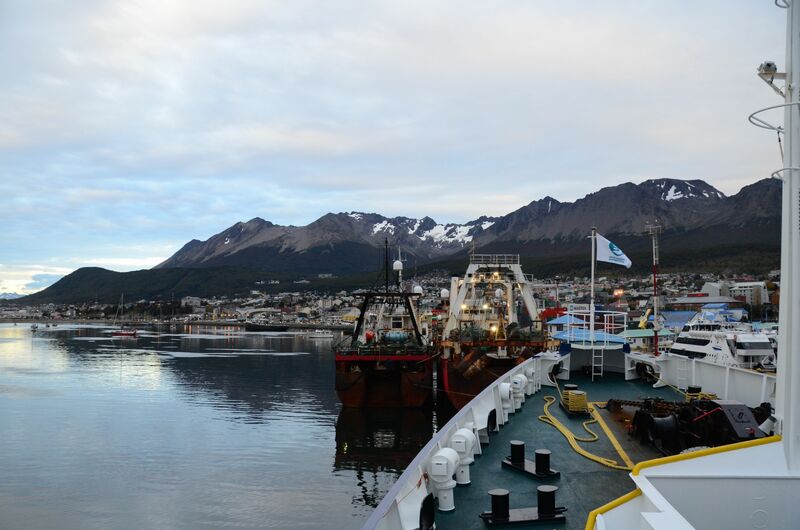 Getting into Ushuaia, the town is totally different from what you’d imagine, with a beautiful airport resembling a rustic log cabin and some pretty lakes surrounded by scenic mountains, it was a city like no other. It also has a casino in the middle of the downtown!!!! Ha ha. Feeling a bit like Banff, Canada, this place is touristy but with a bit of charm, probably because it claims itself as the “end of the world”!!! It was a bit strange though, to see some teas, chocolates and gourmet foods coming out of this region as we’d imagine this place to be inhospitable, far from civilization and rugged, which it is totally the opposite of! The day was spent running around working errands to prepare for our BIG trip to an awesome place. Dinner was a DELICIOUS fuegino lamb, which is a breed of sheep particular to the region and is delicious. And it also helps that Argentinean wine is delicious, and goes perfectly well with a good hunk of meat. Being separated for the first in many months, Jiajia flew into Ushuaia with a 7am flight, but because of the crazy weather down in the southern end of America, her flight had to stop in Rio Gallegos before the weather cleared out and the plane was ready to land. Alan spent the day in Buenos Aires wandering around the town, visiting gardens and museums, taking pictures, and doing some grey market deals to exchange some spending cash.